A breed standard represents the idealized animal, the very pinnacle of the breed, but while it outlines the phenotype of the idealized animal, its real function is to define the population. It is meant to be the carrot and the stick that helps shape and refine a population for the serious breeder. Naming your goals is the first step to achieving them. So we here at One Earth Farm have christened this ‘burgeoning breed’ of ours Napa. The name is borrowed from the sacred white herds that were once reserved for the Incan ruler himself. 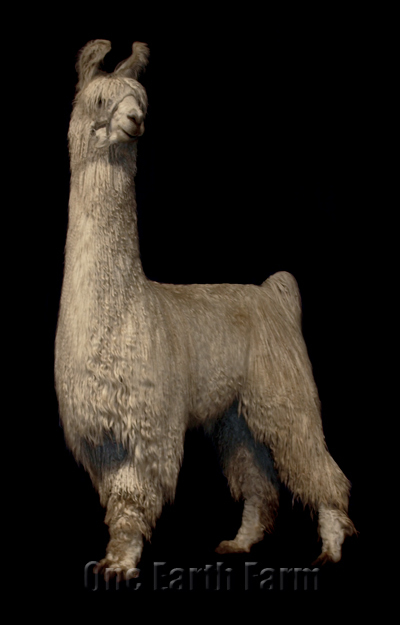 These herds represented the pinnacle of breeding excellence and purity, and by decree, only the Inca himself could possess a pure white llama. 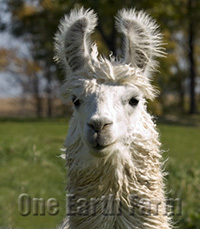 Such decrees were based on political and religious beliefs, but it was exactly this sort of archaic system that resulted in the gathering of superior animals into one location to form ‘nucleus herds’ that consequently gave rise to the pure breeds of llama upon which the Incan empire was built. The Napa name therefore embodies both our breed standard and the nucleus herd we are slowly building here at One Earth Farm. Overview: The Napa is a majestic animal that possesses natural presence and a robust frame. It is friendly and calm and curious. Its overall impression is one of strength and fluidity of movement, with all body parts in such harmony that the transition from one to the next is seamless. Ears are long and erect with a strong inside curve. 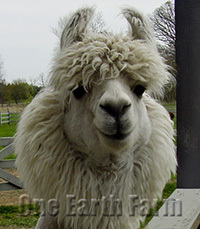 Its distinguishing feature is its luxuriant dense pure white fleece that covers it from its forelock to its toes. The fleece may be either of suri fiber that is straight and well locked or of a huacaya fiber that is crimped and well bundled - but in either case the fleece should be fine, abundant and lustrous. The Napa head should show good depth and length of muzzle, with ears placed well up on top of the head. Eyes must be dark and the overall expression should be noble and intelligent. Its neck should be set high, rising straight up from the withers and should show sufficient length relative to the body and legs. The chest should be moderately broad and deep and exhibit correct angulation through the shoulders. The back should look strong and the ribcage should be moderately sprung. Transition from the shoulders through the withers, across the topline into the hips should appear smooth and strong and should not appear piece meal. The tail is carried naturally high. The legs should be of substantial bone and should exhibit proper conformation to allow for a fluid elegant gate. The preference is for very tall statuesque animals of a robust build and a noble demeanor. The Napa should have a steady easygoing disposition and be naturally trusting. Reproductive fitness as well all fitness traits should weigh in heavily in selection of breeder animals. The Napa should show great vitality and selection must always be away from animals requiring coddling or special handling. We drew up this very rudimentary Napa breed standard as our own carrot and the stick approach to guide our llama breeding program. Of course the Napa breed as a bonafide population does not yet exist, and the herd here at One Earth Farm is still merely a conglomerate of outcrossed and unrelated animals – however phenotypically similar. Still, we put forth this breed standard as a means for others to better understand the direction we are taking our herd. It represents our future, whereas our photos can only represent our past.